Beginning in 1992, photographer David Rose was Bruce Springsteen’s shooter of choice for a full decade. It was a time of transition, experimentation and reunion for the rock superstar – marked by his first albums and tours without the E Street Band – as he raised his young family in Los Angeles and New Jersey. Rose documented much of that era on the road, in the studio and at home with a mostly unguarded Springsteen. 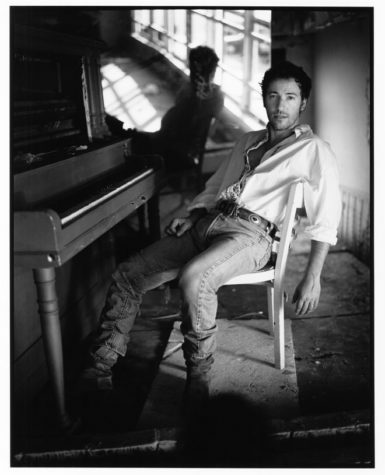 A selection of photographs from this era has just opened in “Unseen Springsteen: Intimate Portraits,” Rose’s first exhibition at the Mr. Musichead Gallery in Los Angeles. The show, through June 2nd, coincides with the release of Springsteen’s new deluxe vinyl box set, “The Album Collection Vol. 2: 1987-1996,” which includes more than a dozen of Rose’s photographs.